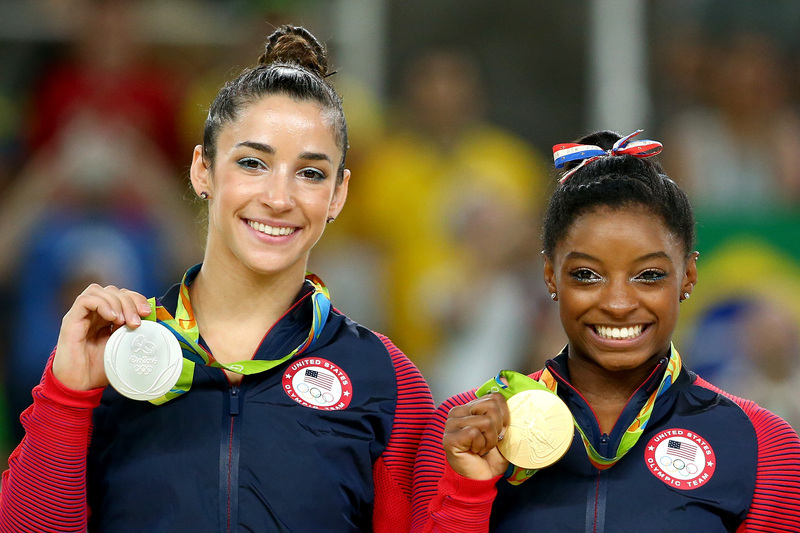 If you've been paying any attention at all to the Rio Olympics, you are probably familiar with Simone Biles, Gabby Douglas, Aly Raisman, Laurie Hernandez, and Madison Kocian. The U.S. women's gymnastics team is a favorite at the Summer Games, and this wouldn't be the first time. But if you're not an avid gymnastics fan, would you be able to name the men's gymnastics team? Who got the bronze medal in the men's pommel horse competition, for instance? The question you may not know the answer to should prompt another inquiry: Do we pay more attention to female gymnasts in general? There isn't a definitive answer here, but it is worth examining why women's gymnastics seem to get more coverage and attention than men's gymnastics, at least during the Olympic Games. According to The Chicago Tribune, Team USA sent 292 female athletes to the games this year, compared to 263 male athletes. And the fact the U.S. sent more women than any other country did in 2016 is something to be incredibly proud of. And of all Olympic sports, there is something particularly significant about the appeal of women's gymnastics over men's gymnastics. Not only is the sport's Olympic viewership particularly high, but more and more girls and women are becoming involved in artistic gymnastics. Perhaps, as The Huffington Post's Chloe Angyal speculated, the appeal of women's gymnastics has to do with the ways in which it pushes the boundaries of gendered expectations. The sport has come to emphasize lower musculature over a skinny stature, and has increasingly promoted strength and athleticism. Moreover, women's gymnastics has worked to challenge the stereotype that femininity and athleticism are somehow not compatible. Female gymnasts amazingly pushing the limits of physics with their routines stops that stereotype dead in its tracks. However, there's also a potentially problematic nature of women's gymnastics' popularity. The sport certainly challenges preconceptions about athleticism and femininity, but only — as Angyal points out — to the extent that we are still comfortable. Performance aesthetics seem to precede more competitive aspects of Olympic gymnastics, which means women's bodies are still objectified even as they execute impossibly difficult moves. In the same vein, men's gymnastics may not garner as high a viewership because it doesn't seem to involve the aggressive competition stereotypically associated with male-dominated sports. Female gymnasts are incredible athletes, but coverage of women's gymnastics sometimes misses the point, focusing on the athletes' physical appearances and what they are wearing. And when female athletes don't meet restrictive gendered expectations of femininity, they are criticized for being too masculine. It's great that we pay so much attention to women's gymnastics at the Olympics, but we should go one step further and stop being comfortable with the gendered expectations that female gymnasts and other female athletes constantly face.